There’s a whole lot of new going on! Yesterday, Isaac began his junior year at a new high school, in a new town. Tonight begins Rosh Hashanah, the Jewish New Year. Later this month, Sam begins college in a new state. It’s an exciting time! The timing this year of Rosh Hashanah and the start of school in the same week is a bit hectic, but also rather ideal to me. The vision of a lovely, fresh year stretching ahead, full of possibility, learning, fun and growth, is quite appealing. My arms are wide open! And at the moment, my arms are hugging a new bottle of date syrup, a gift from dear friends who just returned from a family visit to Israel. When Julie gave it to me, I really did hug it – she remembers how much I love this sweet stuff. 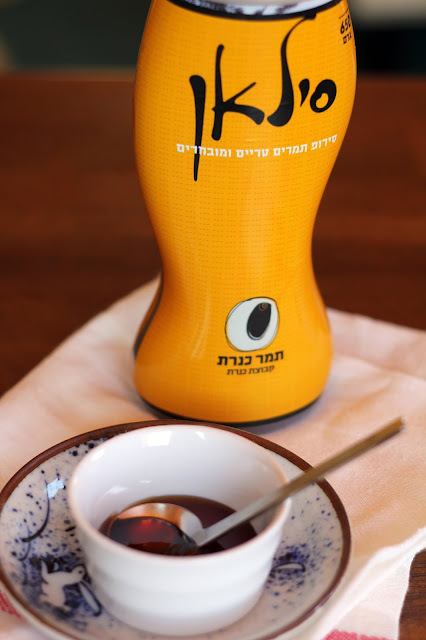 Five years ago, our families were together in Israel to celebrate Sam’s bar mitzvah and we discovered date syrup. Date syrup is thicker than maple syrup, with the distinct flavor of dates and a rich brown color. It’s delicious over ice cream or yogurt, and when stirred into tahini it makes a marvelous dip. I’m thinking it will be a terrific vinaigrette ingredient, too. I’m also happy eating it with a spoon. Sweet foods, such as honey, carrots, dates and apples, are traditional to eat during Rosh Hashanah. 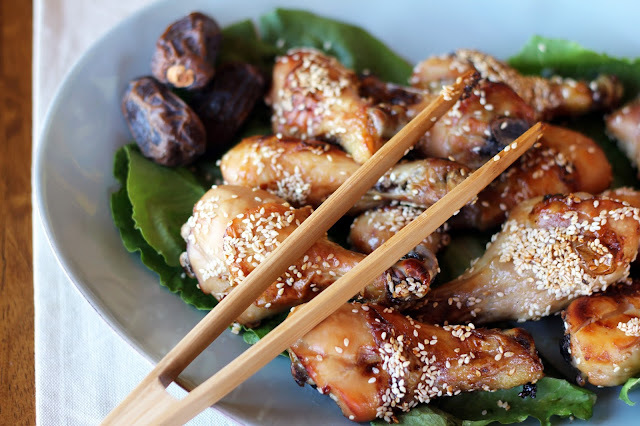 With this in mind, I brushed some chicken drumsticks with date syrup and roasted it for a simple, delicious dish. When the chicken emerged from the oven, the kitchen filled with the warm, delicious scent of dates. 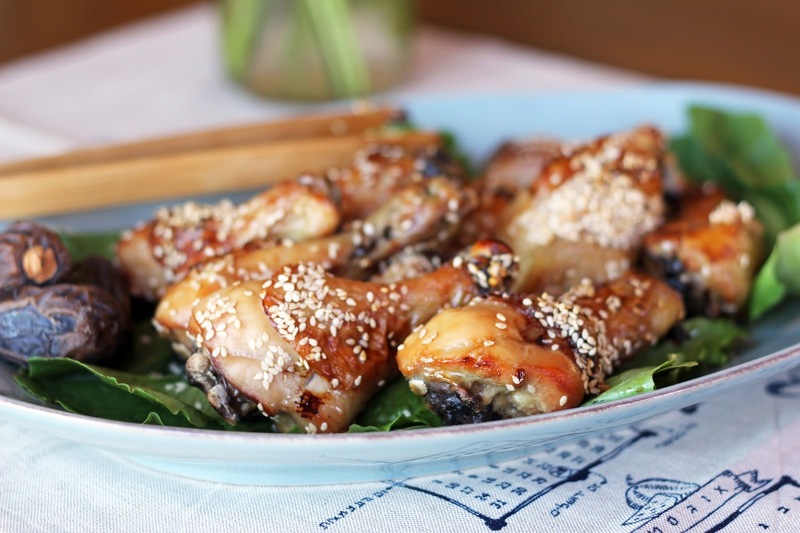 The drumsticks were beautifully glazed, with a sprinkling of sesame seeds for added texture and flavor. The chicken was meltingly soft, sticky and tender, with a deep caramelized taste. Perfect for a sweet holiday! I’m looking forward to gathering our family around the table with friends to dip apples in honey (and date syrup!) and celebrate this new year. Shana tovah u’metukah! Wishing you all a good and sweet year. Happy 5774! Preheat the oven to 375 degrees and pull out a rimmed baking sheet large enough to hold the chicken in a single layer. 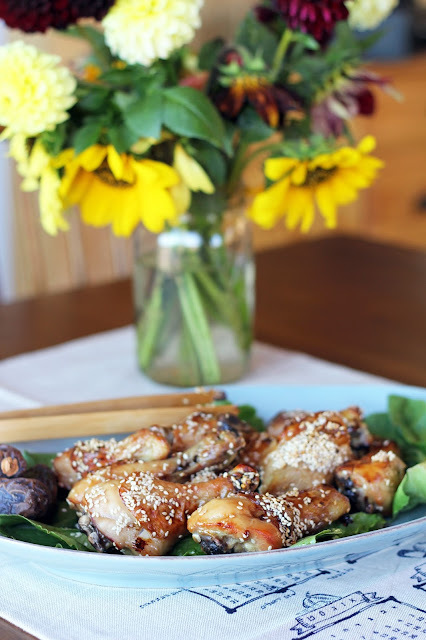 In a large bowl, combine the chicken, date syrup and sesame seeds. Toss with your hands to coat evenly. 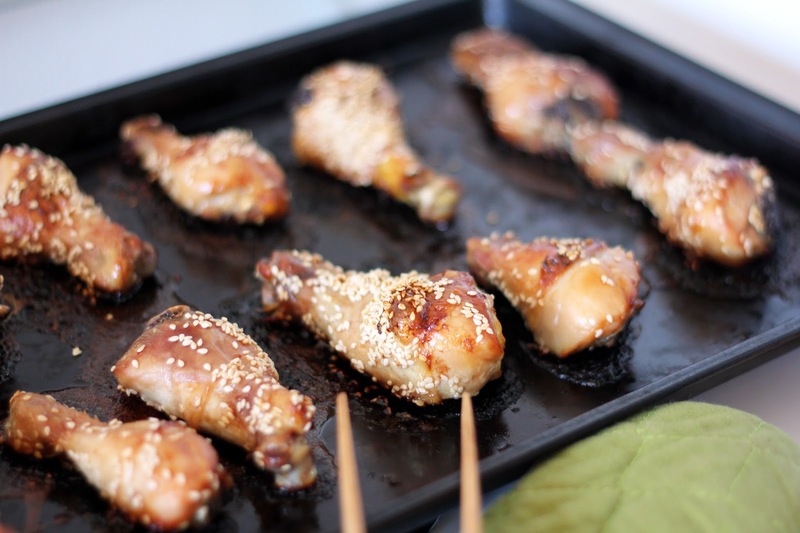 Place the drumsticks in a single layer on the baking sheet and pop in the oven. Bake for about 45 minutes, or until the chicken is done to your liking. Serve warm with additional date syrup for drizzling. Date Syrup? I need to get my hands on some of that! So many exciting and wonderful changes Hannah. What a way to welcome in the New Year! It is indeed a wonderful start to the new year, Alyssa! Hopefully you can find some date syrup (also called date honey). I'm also thinking it could be fun to make...I may try that when this bottle runs out. I don't believe I've ever had date syrup - love the idea of it, though. This dish sounds so terrific, and perfect for the New Year! I love date syrup and use it a lot.However,the one that you got has also sugar while I prefer the ones without added sugar. Shana tova to you and your family! What a delicious dish to celebrate the New Year. I've never heard of date syrup but know it must be wonderful. Date syrup is such a sweet treat, Karen! It's definitely worth seeking out and trying. Delicious. Date syrup is so flavorful. L'shanah tova! Isn't date syrup wonderful, Amanda? L'shana tova to you, too! hmmm - date syrup might have to be another TJ topic. I've never tried it but I think it's called out in some of the recipes. 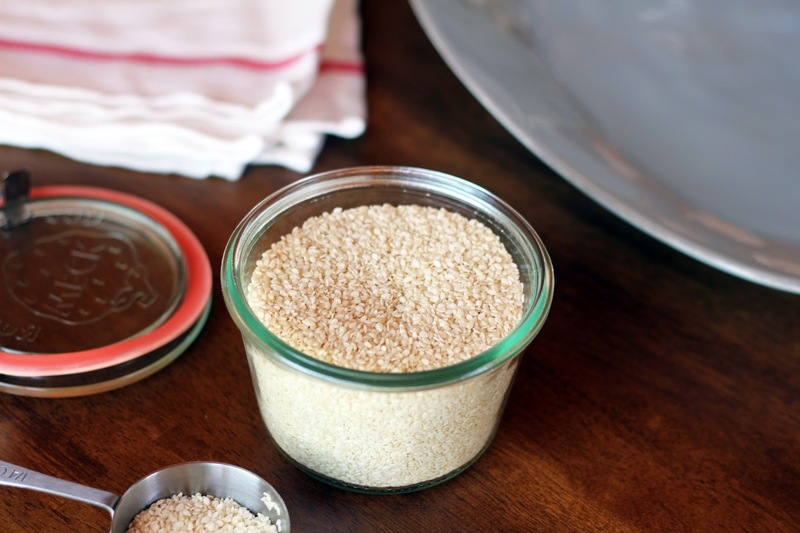 This recipe is so simple but so intriguing. Can't wait to get a bottle and give it a whirl! Hope all is going well at the cabin and with the new school year. I wish Sam the best as he prepares to head out to college. Keep me posted. So far, all is well with Gregory. Next weekend, he'll come home and make blintzes with me. I'm looking forward to it! All is going well here in the valley. Isaac is off to a great start in school and Sam will be taking off in a couple of weeks. Thank you for your good wishes! Have fun making blintzes with Gregory...that sounds like so much fun. I would love to get some of that date syrup. I love dates and this has to be wonderful. Happy New Year to you and your family and that chicken dish sounds delicious! As I've been paging through Jerusalem looking for the pom syrup recipes, I keep bumping into more w/ date syrup that I want to try. The chicken looks great, now I've just got to get my hands on a bottle around here! We are so blessed here in the Middle East (we are transplants from Canada). We can buy buckets of date syrup. In fact, we quit using refined sugar entirely and even avoid anything that contains high fructose corn syrup and we are amazed with the results. Neither one of us gets sugar cravings anymore and that blood-sugar up and down thing my husband use to get has completely disappeared - he even lost around 25 pounds! We use date syrup to sweeten our hot cocoa and put it on our oatmeal. 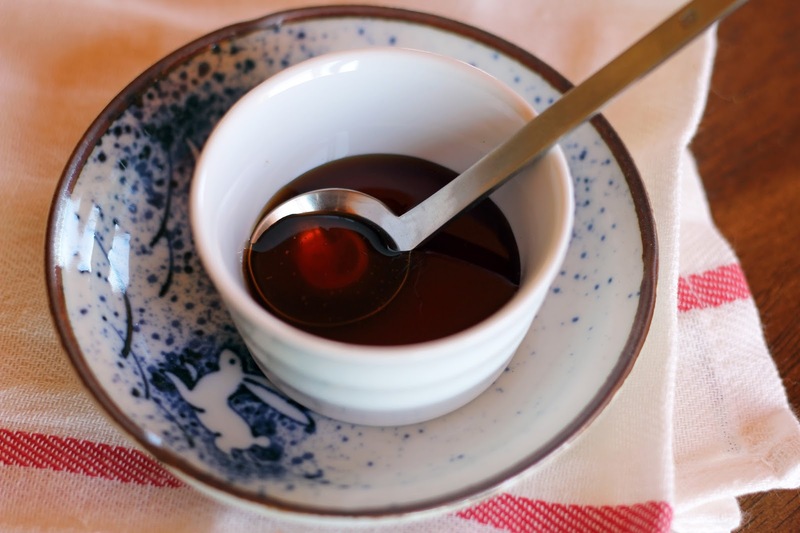 Date syrup doesn't cause the problems in the diet that refined sugar does. I'm now looking forward to putting date syrup on chicken wings. Thank you so much for this simple and delicious recipe! !